Undated headshot of James E. Brodhead, Box 41, Folder “Biographical Photos, 1941-1970,” James E. Brodhead papers, #7389. American Heritage Center, University of Wyoming. James Easton Brodhead (1932-2012) was a character actor who worked in various motion picture, television, and theatre productions. He graduated from the University of Michigan with a Bachelor’s degree in Speech in 1954. From 1950-1963, Brodhead appeared in numerous stage and live television productions. In 1963, Brodhead changed careers and became a journalist with “Time” magazine from 1963-1969, covering various stories including the assassination of Robert Kennedy and the ensuing trial of Sirhan Sirhan. He then left “Time” to write a book on “Rowan and Martin’s Laugh-In,” and worked as a public relations account executive for a short time. In 1971, he returned to acting full-time, appearing in “The Apple Dumpling Gang,” “The Strongest Man in the World,” “Kotch,” “Mame,” and “General Hospital,” among many other motion picture, television, and theatre productions. 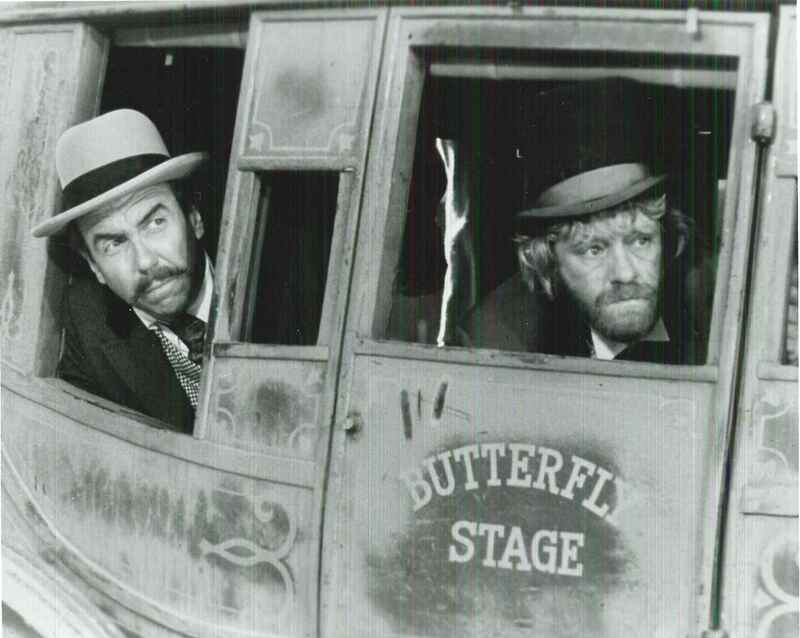 Photographic still from the production of the film, “The Apple Dumpling Gang.” Notes on the back of the photo indicate that this scene was cut from the final version of the film. Box 41, Folder “Photos–Apple Dumpling Gang,” James E. Brodhead papers, #7389. American Heritage Center, University of Wyoming. 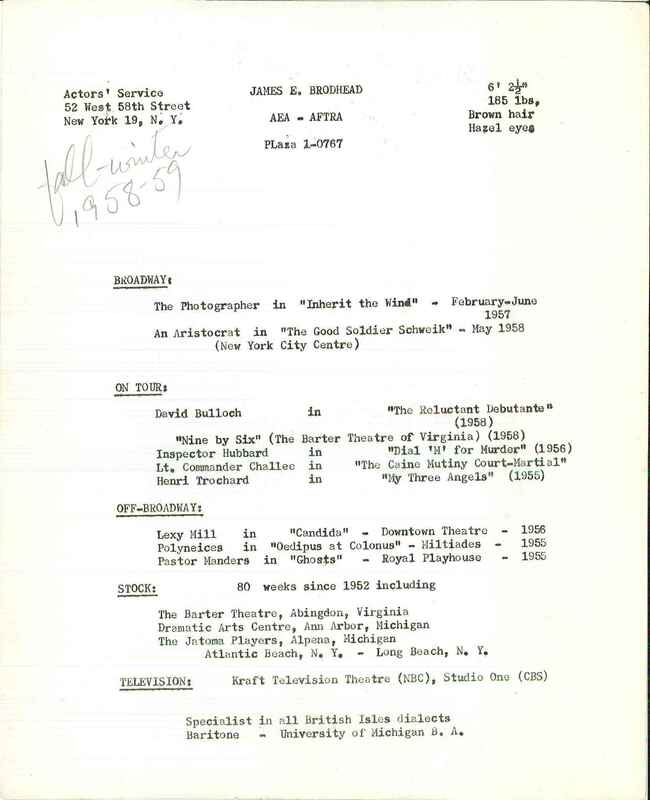 His collection contains personal and professional files relating to James E. Brodhead’s career as both an actor and a journalist. 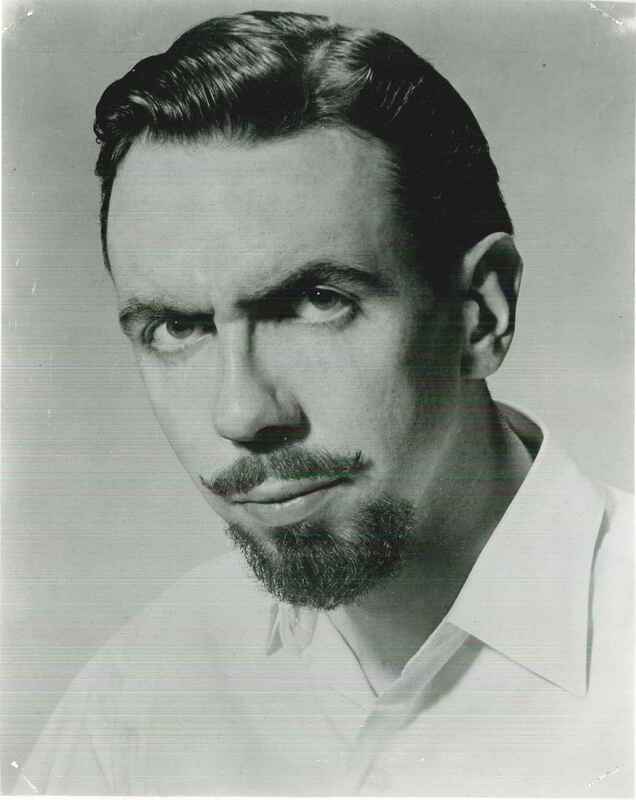 It includes correspondence, subject and manuscript files from his stint as a writer for “Time” magazine and other organizations, scripts for productions of which he was a part, and photographs of Brodhead primarily depicting him in his various motion picture, television, and theatre productions. Brodhead’s acting “resume” on the back of a montage of headshots. Box 41, Folder “Biographical Photos, 1941-1970,” James E. Brodhead papers, #7389. American Heritage Center, University of Wyoming. The American Heritage Center is pleased to announce that this collection is newly processed and an online inventory is now available! This entry was posted in Journalism, newly processed collections, popular culture. Bookmark the permalink.